On the rare occasion when I get the house to myself and have nothing really useful to do, I tend to spoil myself rotten. Yesterday, this involved hiding the mobile phone, renting a movie and hitting the couch very hard indeed. I like to watch movies that I know Trish wouldn’t be bothered with but which I will probably enjoy. So that, almost invariably, leads me straight to the horror section. 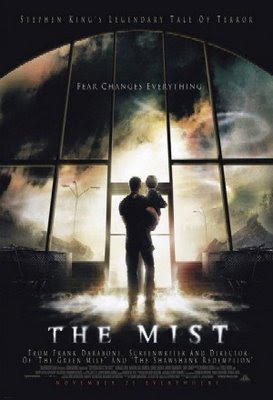 Yesterday I treated myself to ‘The Mist’ – which is one I had wanted to see for some time. I knew the Stephen King novella since it was first published and liked it a lot so that was a good start. Add to this that Frank Darabont wrote and directed this one and he had already done quite well with adapting King material such as ‘The Green Mile’ and, of course, that ‘Shawshank’ thingie. I had also heard a few dubious comments about this film which served to lower my expectations nicely. So, as I lowered the blinds, I expected nothing more than a fun ‘creature feature’ with a few gory moments and, hopefully a couple of hours peaceful diversion. I actually got quite a but more than I bargained for and that is the primary reason that, if you can stand a little horror, I am going to recommend this movie to you. The story concerns a diverse group of people who become trapped in a local convenience store when a sinister mist descends upon their town after a frightening storm. It soon becomes clear that there is much more to this mist that meets – or obscures – the eye. ‘The Mist’ ticks all the boxes for an adult horror flick. There are monsters, tension, gore aplenty and there are also many of the stock characters one would expect to encounter in one of those ‘Group of people verses the creatures’ movies such as ‘Tremors’. But, after ticking these boxes successfully, Frank Darabont then takes the material quite a bit further than one might expect. I won’t say how or what ‘cos we don’t do spoilers too much round here but suffice it to say that it is unusual and quite striking in its execution. Very few films are perfect and this certainly is not one of them. Let me try for a few criticisms. The acting seems quite wooden at first, until the action kicks in. There is a religious side-plot which seems overwrought and unconvincing to me. One of the more interesting characters seems ultimately to be underused. Oh and there is that perennial problem that the unknown ‘horror’ out in the mist is infinitely more worrying than what finally materialises but I think, not matter how CGI evolves in the future, this will always be the case – nothing can scare us like our own imaginings can. Finally, on the criticism front, I always feel that Darabont allows several scenes too many into his movies, particularly in the final act. I think this is true of both Green Mile and Shawshank and I think it is true here too. But, all in all, I was very impressed with the time I spent in ‘The Mist’. I found it entertaining, edgy and ultimately more than a little disturbing – which hardly ever happens to me. I will be interested to see if the upcoming Daniel Day Lewis performance in Cormac McCarthy’s ‘The Road’ sparks a revisit to this film – in several key ways, the themes are strikingly similar. In the meantime, I commend this film unto you. Have you seen it? Do you agree or disagree with me? Let me know, eh? I’m over here – can’t you see me? I have to agree with you on this one. I went in to this one with low expectation because most of the time a Stephen King adaptation usually bottoms out. What I found was a very well put together movie. I did find it a few scenes heavy and ran a little longer than it should, but entertaining nonetheless. On the special edition DVD and the Blu-ray copy of The Mist I believe that have the Black and White version of the film which I heard gives the movie an extra level of enjoyment. Haven't seen it but did read the short story. So many times film makers screw up his work [exception "The Green Mile"] so it's nice to hear this one lived up to your expectations. Never seen it; if it's in the horror aisle I very likely never will. Then again, I skip past the wolf-beast fight in Beauty and the Beast. I can't watch horror like that. I spook myself all too well when it comes to dark rooms, hidden corners and so on. But, I always wish someone would tell me the story/ the plot, skipping all the horror. Some of the stories are way over done and really kind of silly but the odd one really stirs the imagination with possibilities. Didn't I recommend this movie to you? :D I quite enjoyed it - I'm a huge Stephen King fan- odd because I don't like horror in general, but I've been reading his books since I was 14 or so. This movie is true to his old style, but not to the point of scaring the living daylights out of people. And- if you haven't read the novella (I hadn't read it), you will be surprised. The Shawshank Redemption and The Green Mile are two of my all-time favorite movies. I think Shawshank could have been cut a little more during editing-some scenes weren't necessary, but with The Green Mile, I think the "extra" was necessary to get the full point of the story. I would love to see a film made based on The Talisman- another great book that never received the attention it should have because it's more fantasy than horror. I won't see the MIST, but I did catch up on movies yesterday. All day long. One of note is WANTED starring James McAvoy, Angelie Jolie and Morgan Freeman. I was pleasantly surprised at the twists and the action was pretty cool. Almost like a Matrix meets Kill Bill, but different. It's worth a look. Zack is actually me. I didn't notice that my nephew had logged in on Gmail using my computer. Zack is Laura and Laura is Zack....gotta love the internet. Hope: I think Misery did good and I like The Shining even though he doesn't. I've read that short story collection, I'll be interested to hear what you think of 'em. Matt: Won't see? Why not, do you avoid horrors? Will watch for Wanted. Thanks for recommendation. Laura: I *knew* it, well actually, I didn't and I'm a bit upset with myself that the most-distinctive style did not shine through. yep, and I'm having the last laugh right now. Not a fan of horrors. i do like mystery and suspense. Some horror, when well done, is cool. Untraceble is cool. Sixth Sense is cool. Alien is cool. Blood and guts, not so much. I'm with Matt on this one. I prefer the ol' Hitchcock version of someone peering around a door to whisper "boo!" at the most unexpected moment. I'll take spine tingling over chainsaws and buckets of blood any day! Ken, did you see "1408"? It was based on a King short story and starred John Cusack. Hope: The one that scares without being graphic is always the scariest, that's for sure. One of my favorites is the original version of The Haunting which does great things with booming sound effects. I used the device for a theatre play of mine called 'Midnight in the Theatre of Blood' and succeeded in making a few bodies jump. Must admit I was disappointed with 1408. I thought the build-up was superb but the delivery of the horror left me cold. I'm not a great horror-watcher, but occasionally get the urge - as just recently. This may well be the next one I will watch. Thanks. I haven't seen the movie yet, mainly because I'm a Mom and I heard it had one of those horrific parent crappy decision things at the end. Plus, my movie decisions seem to be driven by a 7 year old - but at leasst she's a 7 year old who loves Monty Python so I have that going for me. I loved this one. It might sound lame but it kind of swept away my mind and draw me deep into the film - I love it when films do that. I was surpriced afterwards because I had heard so much negative critics of it. I'm not sure if the follow is spoiler, please delete this part if it is Ken; the final scenes tore me up in a way, it was weird, lovely, sad, painful. A movie of my taste. :) I love it that a movie doesn't have to be of extremely good quality to bring me into "adventure modus" where I forget about my surroundings. You are *so* right, R. How in hell did I miss that? ?